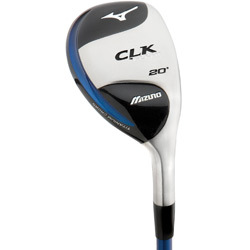 The Mizuno CLK FLI-HI wood type hybrid utilizes an ultra-thin, lightweight titanium crown and high-tech precision stainless steel face and body create a low, deep COG for high launch and maximum forgiveness from any lie. Patented CORTECH technology utilizes three variable face thicknesses to deliver uniform face deflection for unsurpassed distance control, and variable sole weighting and moderate off-set delivers a high, straight ball flight. The NEW CLK FLI-HI utilizes the latest in design technology and cutting edge materials for a high launch, maximum forgiveness, and unsurpassed hybrid performance. Beats my long irons everytime! From Anonymous of Boise, Idaho on 8/27/2007 . This hybrid is easy to hit and goes further then my 3 iron! 8/27/2007 – Does this come with a steel shaft?